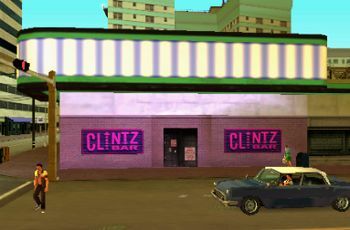 The Clintz Bar is a bar located in Downtown, Vice City. It is situated on the corner of a wide road leading to the bridge connecting Prawn Island and Downtown, and a road which leads to both the Mendez Cartel building and the Hyman Memorial Stadium to the right, and the other leading to the fire station and Lance Vance's old apartment. It's also located on the other side of the road housing the Schuman Health Care Center. This page was last modified on 16 June 2013, at 22:06.